Jesus started his church by calling a few normal, workaday guys to follow him, and then he made a remarkable statement. He told these unschooled, unspectacular, blue-collar guys that he’d turn them into leaders who would make an eternal difference in people’s lives (see Matt. 4:18-20) and ultimately the world. Jesus reiterated the point sometime later when he called together a bunch of the folks he had asked to follow him and asked 12 of them to take their following to the next level. He called these disciples to be a part of a select small group of “apostles,” men who would be enlivened, equipped, empowered, and entrusted to lead his church (Mark 6:13). That’s what Jesus does, still, today. He takes regular, ordinary men and women and calls them; first as followers and then as sent leaders. It’s always in that order. Someone who cannot be a humble follower should never become a leader. By following the Master Leader, you learn how to lead and how not to lead. As you spend time with him, you see his heart for people and you catch hold of that great compassion. As you abide with him, he pours his love and power and grace into you so that you can then overflow that same love, power, and grace into those around you. In other words, following Jesus forges you into a leader. The anvil of real Christian leadership is a follower of Jesus who becomes more and more like Him. 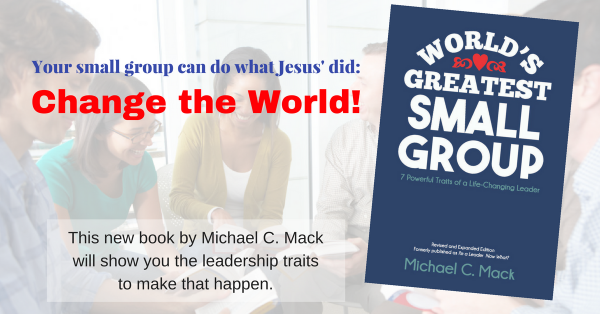 Before you lead your small group this week, be sure to be a follower first. Spend time with Jesus and allow him to saturate your mind and heart with his love and wisdom. This may sound odd, but don’t pray—at least not in the way you usually think of prayer, as uttering so many words. Just sit with Jesus and enjoy his presence. Ask him to lead you. Then let him.